'Spider-Man 3' came out swinging in its first six days in stores, setting a new opening-week record for Sony with over 130,000 Blu-ray units sold, according to studio estimates. Long considered one of high-def's "holy grail" franchises, Spidey's high-def bow was sure to be impressive, and indeed its 130K opening salvo handily trumped Sony's previous record-holder for first week sales, 'Casino Royale,' which is now reported to have sold 40,000 units in its opening frame back in April. However, 'Spider-Man 3's debut numbers still trail what remains the top-opening Blu-ray title across all studios, Warner's '300,' which moved a combined total of 250,000 units on both Blu-ray and HD DVD its first week out, of which roughly 165,000 were said to be Blu-ray. Regardless, 130,000 units is nothing to sniff at, and it's worth noting that Sony says that number doesn't include copies of 'Spider-Man' that have been bundled with the company's new $399 40 GB PlayStation 3. At press time, it wasn't clear whether or not Sony's number also included sales of the concurrently-released 'Spider-Man Trilogy' boxset, which has consistently outsold the stand-alone release at Amazon.com (according to sales rank data). 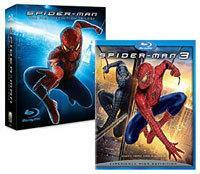 For its part, Sony's remains bullish on the disc's sales prospects headed into the holiday season, pointing to the 400,000 Blu-ray copies of 'Spider-Man 3' that have already been shipped to retail. "We are well-placed for the holidays," David Bishop, Sony's worldwide president, told Video Business. "We got in before the key shopping season, and now you'll have more people getting into the market, as new players are launching from Sony, Sharp, Panasonic [among others]. It's our hope that they walk out with a player and 'Spider-Man 3.'"